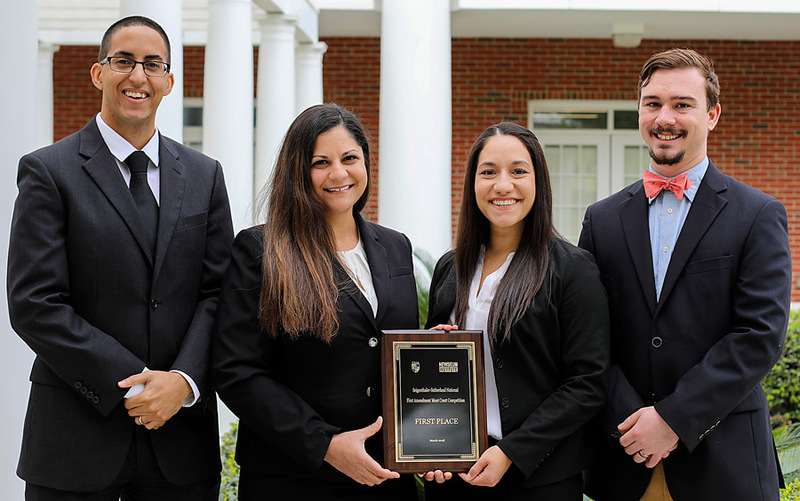 The Florida State University College of Law Moot Court Team won first place in the Seigenthaler-Sutherland Cup National First Amendment Moot Court Competition held March 23-24 in Washington, D.C. The competition of 24 law school teams included some of the nation’s top law schools. In the final round, Florida State won against South Texas College of Law Houston, ranked by preLaw Magazine as one of the best law schools for moot court. Winning team members are third-year law students Brenda Czekanski (Miami) and Jenna VonSee (Orlando). FSU College of Law alumni Jonathan Martin (’15), assistant general counsel at the Florida Department of Financial Services, and Ian Waldick (’16), staff attorney at the Florida Supreme Court, coached the team to victory. Martin and Waldick previously won a national moot court competition in 2015 when they were law students at Florida State. Florida State’s advocacy teams have a strong record in national competitions. Last November, the FSU College of Law Moot Court Team won first place in the 2017 Appellate Lawyers Association National Moot Court Competition in Chicago.